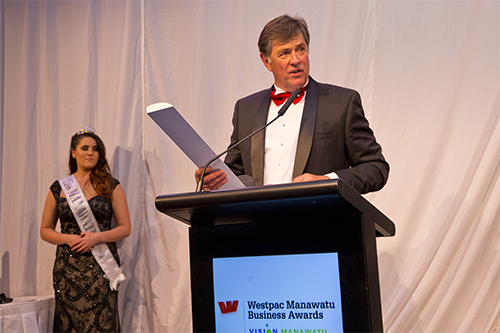 Property Brokers is proud to be this year’s recipient of the Spirit of the Manawatu Award, at the Westpac Manawatu Business Awards, held on Friday 14th November. The Manawatu Business Awards provide a valuable opportunity for local businesses to review their business practices, celebrate success, acknowledge the contribution of staff, network with other local businesses and gain objective feedback from a panel of experienced business people. The Spirit of the Manawatu Award celebrates a business or organisation that significantly contributes to and gains from its presence in the Manawatu. “Recognition gained from an award such as this raises the profile of our company and recognises our long term commitment to the Manawatu community. All of the Property Brokers’ family view our company as being in a special relationship with our suppliers, our clients and customers, and with the many people who touch our business. We live in a wonderful country, in a proud and prosperous province, and we see our role as helping the Manawatu to thrive.